Sally Oldaker meets an artist who specialises in memorial sculptures. Villagers who have been delighted by the new “serpent and apple” sculpture in The Meadows in Alvechurch will be interested to learn that its creator is an international public artist of some renown. The installation, carved from the remains of the huge black poplar tree that fell earlier this year, is the latest creation in the impressive portfolio of Andy DeComyn, who has carried out a number of prestigious commissions in Britain and Europe. Specialising in large sculptures and public installations, Andy works in a variety of media including bronze, stone and wood and has even pioneered a new way of working with concrete to create unique sculptures. It all happens in his somewhat unassuming studio, a former cow shed at Wast Hills University Farm near Hopwood. Based on former Cadbury land, the farm – and Andy’s shed in particular – once supplied all the milk to the Cadbury factory. “It’s fairly basic, but better than commuting to Birmingham to a studio in Digbeth,” remarks Andy. On the day of our visit, he was working on a giant (one and a half times life size) figure of a coal miner, created using his own invented technique – a wire frame wrapped in wire mesh with a concrete mixture on top. 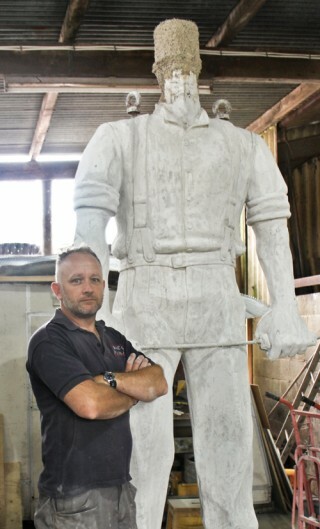 This is one of four similar statues which are destined for installation in Rugeley, Staffordshire. “It’s a former mining town, and a group of ex-miners asked for a memorial both to the industry and the miners who died there,” Andy explains. The 18-month project should be unveiled in August next year. Before embarking on each statue, Andy creates “moquettes” – smaller versions of the eventual giant figures – and then replicates them on a large scale by using tools such as proportional callipers and a laser measuring device. This is not the first time that Andy has “done” a mining-themed project: in 2009 he was commissioned by Wigan Council to sculpt The Last Shift, a depiction of miners emerging from the shaft for the final time. He branched into super-sized sculpture while studying at the Birmingham Institute of Art and Design, part of the University of Central England (now Birmingham City University), having previously studied at Bournville College of Art and Stafford Polytechnic. “I wanted to create public art on large scale, but in order to get commissions you need to have a portfolio. . . but then how do you build a portfolio if you haven’t had any commissions yet?” says Andy. For his final degree show he created a piece called Shot at Dawn, in memory of soldiers executed for alleged desertion in the First World War. This involved a concrete sculpture of a young soldier blindfolded and tied to a post, surrounded by 306 wooden posts with name plaques to represent each soldier. There was a huge amount of media interest – it even made the front cover of The Telegraph – and Andy donated it to the National Memorial Arboretum (NMA) in Staffordshire in 2001. “I like to think it helped towards the government’s decision to give a posthumous pardon to these men, and it’s still the only memorial that commemorates all of them,” says Andy proudly. As he had hoped, the buzz surrounding the project led to further commissions, many of them on a similar theme. Andy went on to create the ATS Memorial, Berlin Airlift Memorial and Mercian Volunteers Memorial, all at the NMA. Andy’s portfolio also includes a memorial to Signals Intelligence officers killed in action, located at GCHQ, Cheltenham – this is cleverly positioned to cast a symmetrical shadow at 11am on November 11. He also made the Holocaust Memorial in Redditch town centre, based on a competition-winning design by a local youngster. Further afield, Andy was invited to create the Pipers Memorial at Longueval on the Somme – and this inspired him to learn the bagpipes himself! In fact, if you spotted a lone piper wandering through Alvechurch this summer and wondered what that was all about, it was Andy - taking part in “guerilla art” organised by Apollo Community Arts. The Meadows sculpture was a collaboration between Andy and Apollo, which is run by fellow Hopwood resident Ken Banks. “We had a brainstorming session on the best way to use the fallen tree, and thought the trunk lent itself to the shape of a serpent,” Andy explains.